Well we have come to the final week in our Alice in Wonderland theme, I have had a bunch of fun sharing the ideas we used at our daughters birthday party and expanding on them. I've actually found some ideas that I wished we had tried. I have included all the previous posts I have written below, with all this information you are set for a complete Alice In Wonderland party. This week I have two great, easy recipes that just fit perfectly into the English Tea Party theme that really works with Alice In Wonderland. Im starting with this one because, it's the one that takes the most effort to do. I think it's easy to do but there are the most steps with this one. In a mixing bowl combine sausage meat with time and season if necessary. I find that the best way to get good quality sausage meat is to buy some really good fresh sausages and just slit the skin to squeeze the meat out. Cover the bowl with cling film and put in the fridge for 20 mins. Put 6 medium free-range eggs (at room temperature) in a large pan of boiling water and boil for 6 minutes exactly. Drain, cool under running cold water, then shell. Divide the chilled meat into 6 equal portions, roll each into a bowl with floured hands, then flatten into a disc. Put the disc of meat in your open palm, then put a shelled egg on top. Cup the meat around the egg, then use your other hand to mould the meat around the egg to cover it. Set aside. Repeat with the remaining eggs and meat. 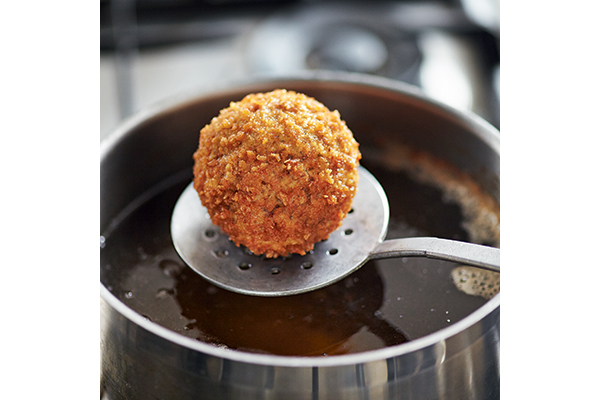 Dip a scotch egg into a bowl of plain flour, then toss between your hands to remove the excess. Dip it next into a bowl of 3 lightly beaten free-range eggs. Shake to remove the drips, then dip into a bowl of 250g dried breadcrumbs. Roll lightly in your hands to press the breadcrumbs in. Set aside; repeat with the other scotch eggs. Fill a deep saucepan three-quarters full with sunflower oil, then heat to 170°C (we recommend that you use a digital cooking thermometer). Cook the scotch eggs in pairs for 7-8 minutes until deep golden and the meat is completely cooked. Lightly dust a clean work surface with flour. Roll out the pastry until about 3mm thick. Using a 7.5cm fluted round cutter, stamp out 12 circles of pastry and use to line a 12-hole nonstick patty tin. Chill in the fridge for 30 minutes. 2Preheat the oven to 180°C, fan 160°C, gas 4. Meanwhile, scrape up the pastry trimmings and re-roll. Then stamp out 12 hearts with a 4cm heart cutter. Put onto a baking tray lined with baking paper. Bake in the oven for 5-8 minutes until golden. 3To make the filling, beat together the butter and sugar in a bowl until pale and creamy. Then stir in 25g beaten egg (use the rest for glazing the scones if making), ground almonds and almond extract until combined. 4Divide the almond mixture equally between the pastry cases, smooth level with the back of a teaspoon, then bake in the oven for 15 minutes until lightly golden. Remove from the oven and, using the back of a teaspoon, press down the tops of the almond mixture to flatten slightly. Heat the jam in a small pan until melted and spoon a little over the top of each one to cover the top completely. Return to the oven for 5 minutes. Then remove and top each with a pastry heart. Leave to cool for 10 minutes, then enjoy warm or cold.